Clarets boss Sean Dyche lamented his side’s defending from set pieces which saw West Brom come from 2-0 down to take a point. But he felt his players got a raw deal from referee Mike Dean. Burnley stormed into a two-goal advantage with goals from Ashley Barnes and Danny Ings in a dominant first half display, only for the Baggies to claw one back on half-time with a Chris Brunt header from a corner. And Ideye Brown earned a point for Tony Pulis’ men with another header from a flag kick after the break - the 14th headed goal the Clarets have conceded so far this season, the most in the Premier League. 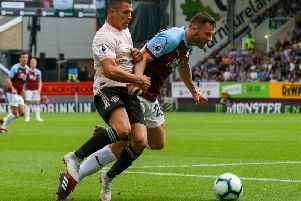 But Dyche felt midfielder David Jones was fouled for the equaliser, and Gareth McAuley’s blatant handball inside the area was also missed by Dean. Dyche said: “I thought , beyond two set pieces, we were excellent, certainly first half I thought we were outstanding, the quality of our play, the progressive nature, the two goals, were excellent. “The team were very good in the first half, the energy, the tempo, the quality, all the things we look for in a performance were there. “Then we gave away a set piece, and that can happen, the second is a disappointment though as there’s a foul on Jonah, then he gets a free header. “The game became a bit like basketball for 20 minutes after half-time, we knocked it long, they knocked it long, but other than that we were very good. “And the way we responded to the second goal, to try and get the third, was excellent. “We’ve managed to keep them down to very few, if any, chances in open play, and there are a lot of positives. It was the third time in four games Burnley have let a two-goal lead slip, but Dyche isn’t unduly concerned: “It’s Premier League football, I would imagine Manuel Pellegrini, after we came back from 2-0 down at Manchester City, probably thought this is a strange business. “We never think a game is dead, we have to see it through, and play hard, which we did. “No, it’s just a reality of this level. The game is never done. “People thought we were done at Manchester City, at Newcastle. This level, you have to be tuned in for every inch. “The players know that and are doing a good job so far. “Nothing is a given in this league. “There is a reality within this league, you can’t switch off for a moment, but today was harsh. “There are certain things we can control, and I’m very surprised we didn’t get a penalty - the handball was a definite. “That’s very difficult to take, we don’t get a lot of those. “And there’s the foul on Jonah. His honesty goes against him, he gets a blocking elbow and doesn’t tumble to the floor. If he does, the referee has to give it. Set plays have troubled the Clarets at times last season and this, but Dyche countered: “There’s a few things, there’s the quality of the ball coming in - we’re operating at a level where the ball comes in with more quality, more often. “Theres the physicality of sides, and Tony’s are a good size. We only have so many to play against that. “Manchester United had a similar thing earlier this season where people were comparing the size of their group to others. “The structure of the team is good, and I like the way they defend usually, but the details are there.